BOZEMAN — Montana State University's TechLink Center has landed a $500,000 contract to continue quality assurance testing on U.S. Army Corps of Engineers software. The one-year award will fund eight computer science student internships at MSU's TechLink Software Engineering and Analysis Laboratory or TSEAL. TSEAL provides MSU students with real-world experience improving the Sustainment Management System, a software application created by the Corps' Construction Engineering Research Laboratory to improve upkeep of hundreds of thousands of federal facilities by helping managers decide when, where and how to best conduct maintenance. 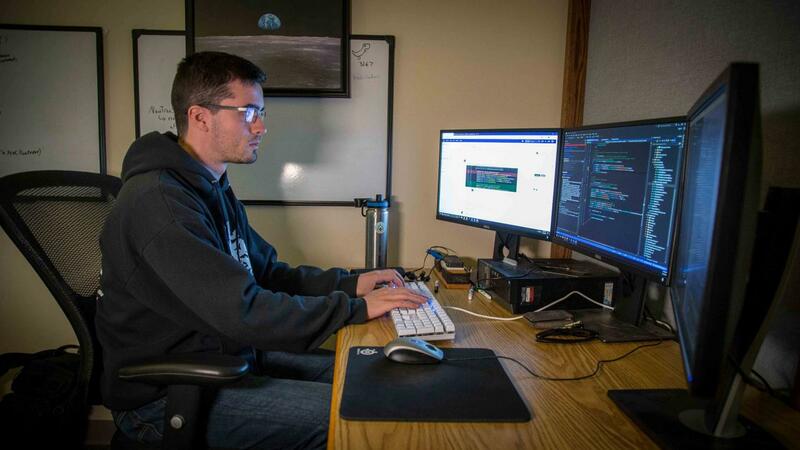 Senior Elias Athey is one of eight undergraduates currently employed part-time by TSEAL, where he writes code to test the SMS. Athey, originally from Anchorage, Alaska, said he appreciates the opportunity to work with a student team while learning the latest industry practices. "Working at TSEAL has been extremely beneficial for my professional development," Athey said, adding that the techniques he has learned give him a leg up in the job market. The computer science students are guided by professors Clemente Izurieta and John Sheppard from MSU's Gianforte School of Computing in the Norm Asbjornson College of Engineering. The students, two graduate students and six undergraduates, also receive a monthly stipend. Since 2013, TSEAL has received $1.2 million — about $200,000 per year — from the U.S. Department of Defense. "We're honored to have earned the DOD's commitment," Izurieta said. "It's a win for the federal government and our students, and it is also validation that our state-of-the-art software engineering methods are relevant." The work has also generated new research techniques to quantify software quality, with two research papers published last year, he added. TechLink, an MSU center funded by the Department of Defense to help U.S. companies license defense technologies for development into new products and services, initiated TSEAL in 2006 to help the DOD attract businesses to its software licenses. "This is the largest contract to date and signifies DOD's long-term commitment to the program," said Chris Huvaere, who oversees TSEAL at TechLink. TechLink has already licensed SMS to more than two dozen companies throughout the United States who primarily use the software to help manage the federal government's facilities, including buildings, airport runways and ports. State and county governments, universities and private companies can use the SMS software to manage infrastructure, said Huvaere. "TSEAL helps the military improve the software, adding value for the government and industry partners who license it," Huvaere said. "The students are essential to the volume of testing that's necessary, and the development of patches for the problems they find."